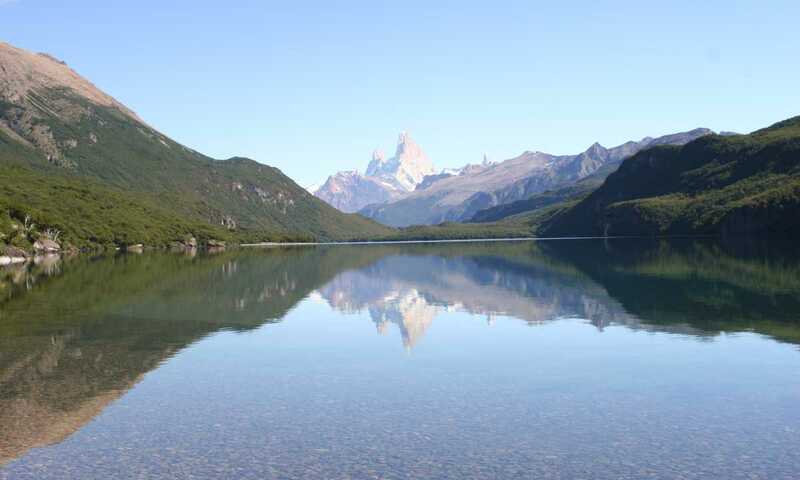 Relax by the fire at a luxurious lakeside lodge on the shores of Lago Desierto after visiting the vast face of the Perito Moreno glacier and taking on Fitz Roy's most famous trek, as well as some wilder guided hikes on unmarked trails. You will be picked up at the airport and driven directly to Perito Moreno Glacier. This is about a 2 hour journey with a few photo stops on the way; you will learn all about the glacier, the area, etc, en route. At the glacier you will have time to explore the walkways that provide great aerial views of the top and the face of the glacier. The roar of the calving is amazing too. After a couple of hours here you will get back on the road and head back to El Calafate. You will be dropped off at your hotel. You will leave Calafate in the morning and travel 225km (2.5hours) of paved road to Chalten and then along the gravel road towards Lago del Desierto for another 37km (90 minutes). There will be a few photo stops and picturesque viewpoints en route, too. At the lake you will leave your main luggage, which will be transported to the lodge and now you will carry on with just your day packs on your camping adventure. You will travel 12km across the lake to its northern point to where your first trekking begins! You will walk in a dense lenga (nothofagus) forest on a path which is not maintained, so the crossing of streams adds to the adventure, After about 5 hours of trekking you will arrive at the Refugio Diablo which will be your new home for the night. 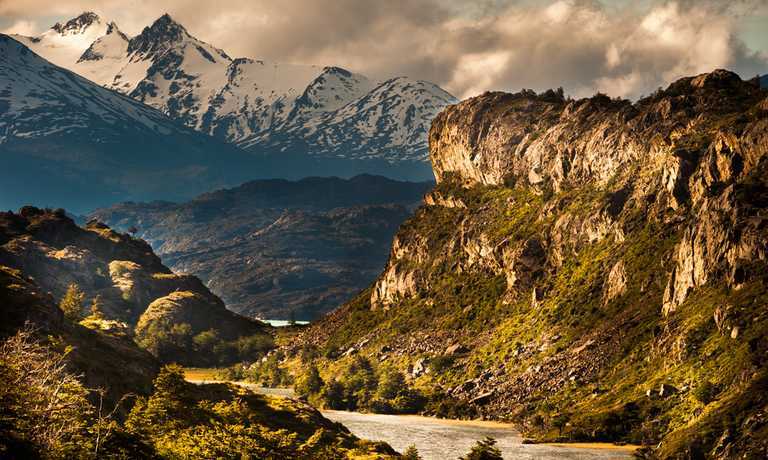 From near here you will enjoy views of different glaciers and the Lake San Martin. After a good hot meal you will be ready to curl up in your sleeping bags for the night. After breakfast you will head back along the same path as the day before and then continue for a few hours along the side of Lago del Desierto to your new home for the next two nights. After some adventurous off the beaten track walking you will have earned the comforts of this uniquely located lodge. You will meet the owners and the local guide who will make you feel very welcome and they will advise you about what you can do while you are there. There is no rush and decisions can be made day by day depending on the weather or how much energy you have left! You might fancy another big walk but if not you could do a half day trek. Depending on what who else is there depends whether it is a half day near the lodge of walking - along the beach , to a viewpoint and waterfalls. It may be a boat ride and a walk up to a glacier... or maybe just a good book curled up next to the log fire. 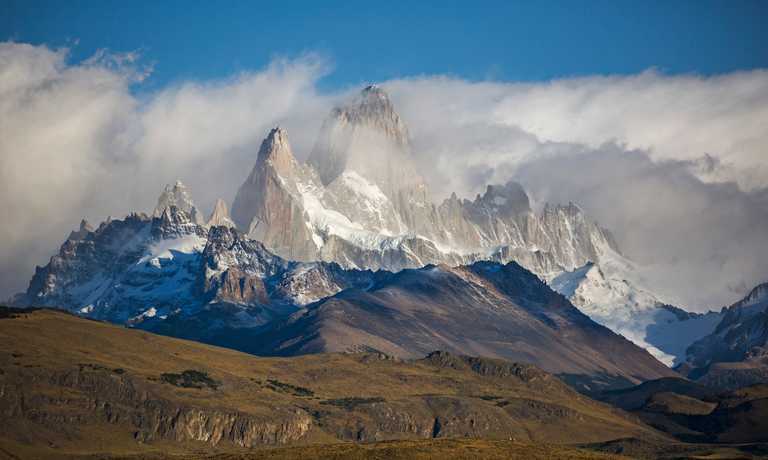 There are various treks that you can do from El Chalten. The 2 most popualar ones are to Laguna Torre and to Pliegue Tumbado. Depending on your energy levels and what the weather is doing, will decide which one you do. Both afford great views and are great day treks. In the morning after breakfast, you will be picked up for your private transfer to the airport. This trip can run as a group trip, with prices starting from $2,100 per person for a complete group. If you are looking to join a group or you are a solo traveller we will help to form likeminded groups of travellers. Please let us know your travel plans. Prices from USD $2,100 per person.